Search-and-rescue efforts are under way after two U.S. military aircraft collided in midair, crashing into the Pacific Ocean about 200 miles off the coast of Japan early Thursday, the U.S. Marine Corps said. At least two Marines have been rescued by the Japanese Maritime Self-Defense Force. Five others are still missing. 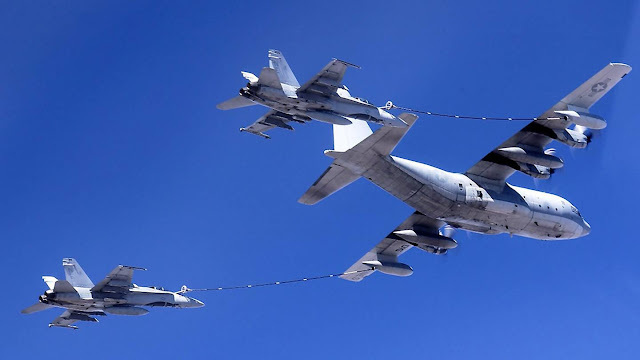 There were five crew members on the KC-130 tanker aircraft and two on the F/A-18 fighter jet. The first rescued Marine was from the fighter jet and is in stable condition. The condition of the second rescued Marine is not known. The U.S. military has about 50,000 troops stationed in Japan. First. God bless the missing and I can only hope for the speedy rescue...those waters are cold and I hope the rescuers are all over this. Second. I can't wrap my head around this. Still waiting for details but how does a KC-130 and F/A-18 collide? I'm assuming that they were conducting refueling operations so did the pilot of the fighter become disoriented? A sudden wind event that pushed the planes together? Some type of mechanical problem that caused this issue? One thing is certain. Marine Air still hasn't righted itself from the string of mishaps its faced over the last few years. Is it the push to become "aviation centric"? That seems too simplistic but it must be considered. Are we asking our aircrews to do too much with too little funding? If this is true then we're all to blame (to include leadership..both civilian and military). If we want our Marines to do these things that are inherently dangerous then the least we can do is fund them properly. I'm curious but I can wait. Let's find these Marines and the rest will sort itself out.